This is based upon a real story: I have a piece of code that launches an external application, but it wasn’t taking into account the possibility of having programs with spaces in their pathnames. Something like c:\mypath\tool.exe worked, but not something like c:\program files\my tool\tool.exe. To be able to launch such programs, we need to enclose the pathnames in quotes. First things first: we need to start with a task in an issue tracking system. Internally at Codice we use TTS (task tracking system), our web-based app for issues. (Yes, if you’re interested in it, I can tell you we’ll be releasing it soon.) The task I’ll be working on is 8651. Next, I’ll switch my workspace to the new branch and start editing the code. Just after I write this code, I checkin the changes, explaining it was a first step in my refactoring. Remember: Because I’m using a task branch, I’m free to create as many checkins as I need, without affecting the other developers! Now I inspect the changes contained in the changeset on branch SCM8651. (It’s the second one you see in the picture. 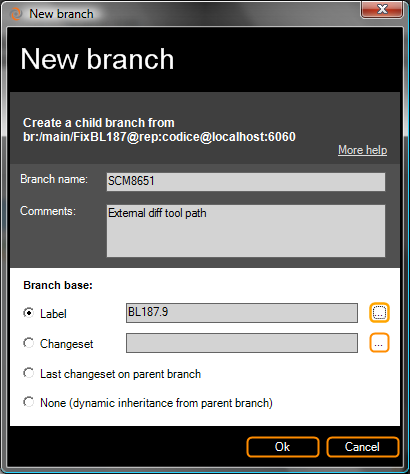 The first cset in a child branch is just there to keep track of its connection to the parent branch). 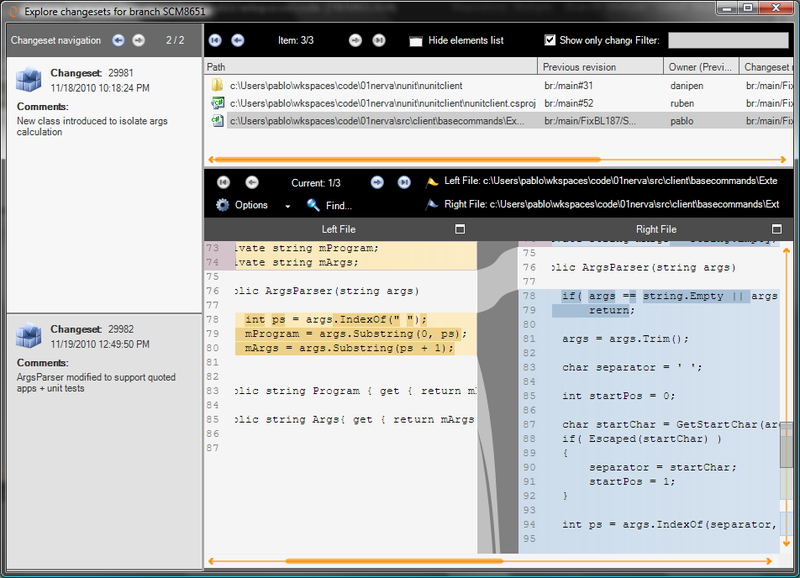 And then I launch the Diff changeset content view, which contains two panes: the top pane shows all the files modified in a cset; the bottom pane shows the line-by-line differences for the currently selected file. It is a nice interface, isn’t it? Plastic is able to track the moved code! 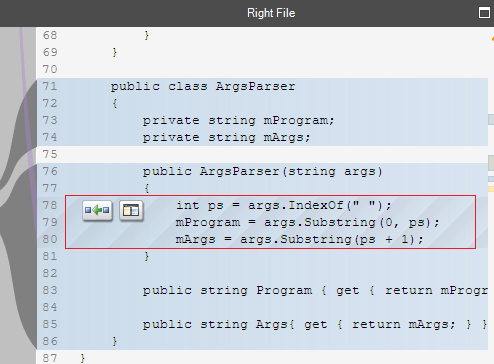 It has figured out that the original lines of code have been moved to a method in the new ArgsParser class. Amazing, isn’t it?? 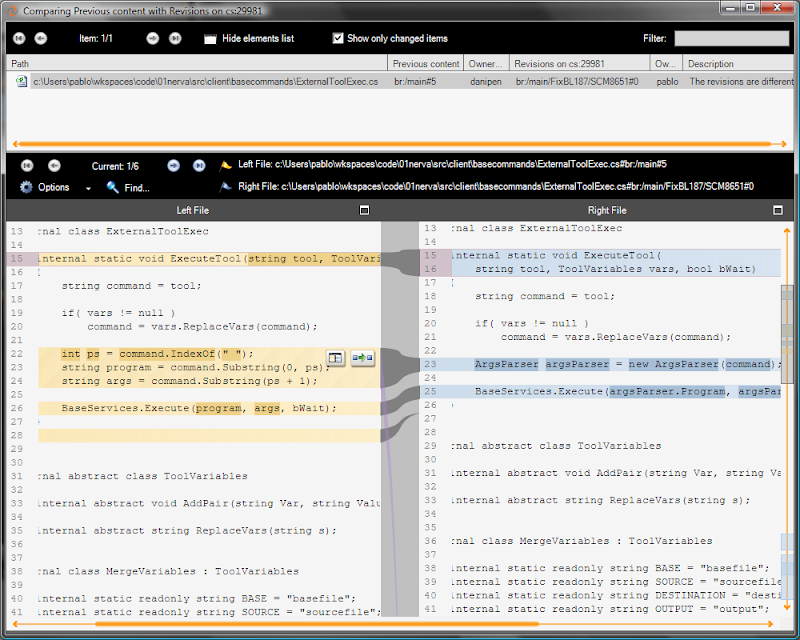 The sub-diff shows how I’ve modified the code AFTER moving it to the new location, renamed the variable names, introduced some class members and so on. Plastic is still able to track it!! 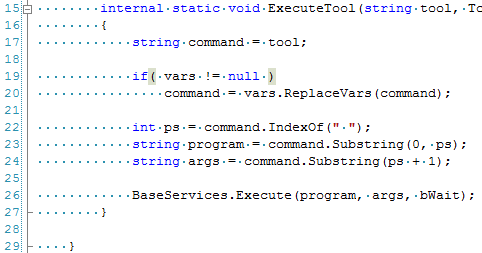 After my initial refactoring, the next step is to actually add the code that handles the quoted program pathnames. I’ll make this change and also add some unit tests to check that my code is fine. This view is very much like the one I used above, Diff changeset content, but with an extra dimension. 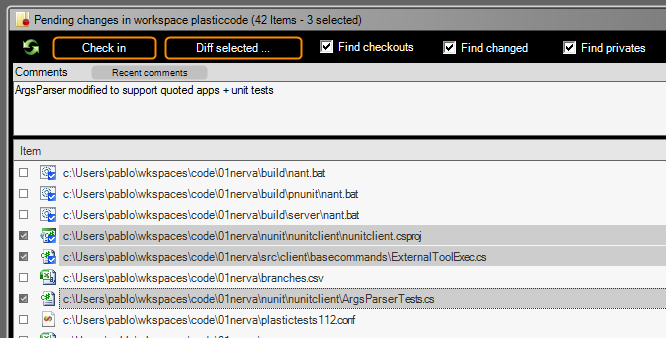 Instead of exploring the contents of a single changeset, I can now explore all the changesets of my branch. As you can see, walking the changes one by one is very, very easy this way. 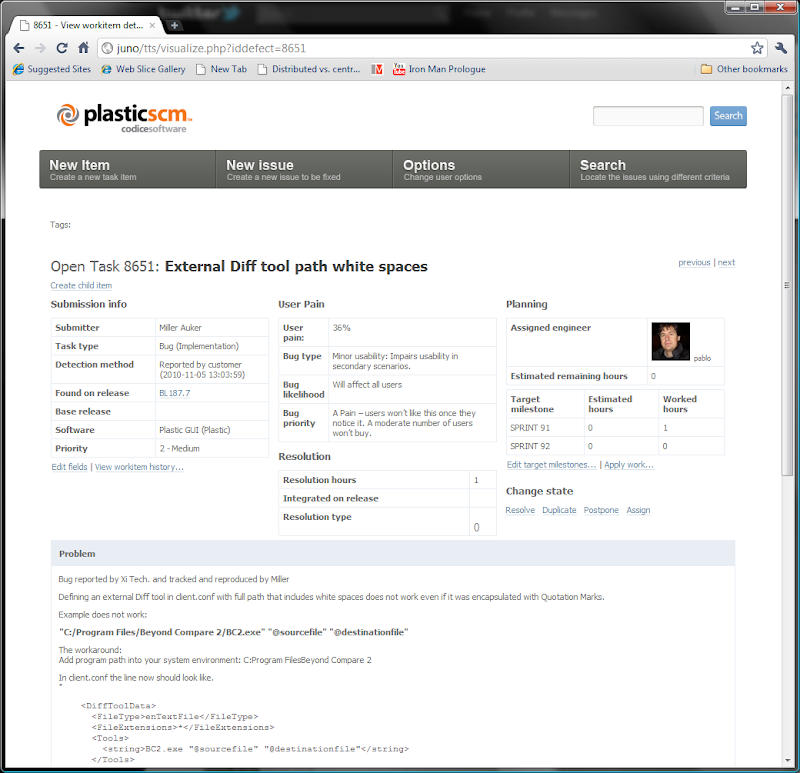 Once I’m done, I’ll run my test suite and then go to our issue tracking system and set the task as finished. Now it is your turn to ask questions! Do you see the beauty of branch per task (or task oriented, if you prefer) development, using Plastic SCM’s powerful visual tools? Great. You branched and fixed the bug. When did you merge the change back into something that will actually be deployed? I don't see that anywhere. @Anonymous: do you want me to explain how to perform a merge with Plastic? I can do it but it wasn't the main goal of my post. 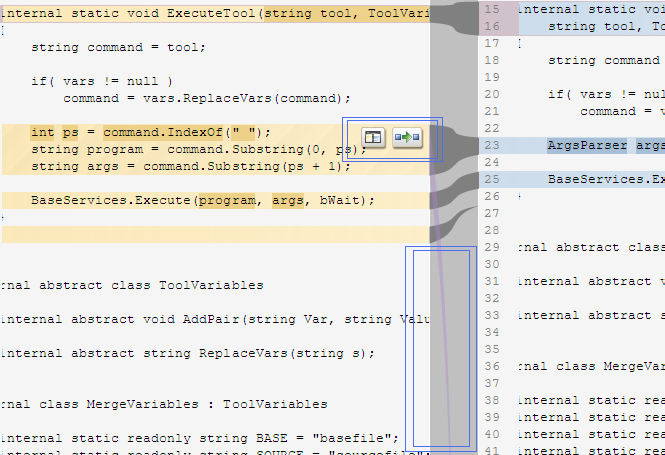 It is just about switching back to the destination branch (1 click) and merging from the source (the task branch). Really easy. Or am I missing anything? I don't get it. Why not just fix the bug and commit it on trunk? @Anonymous. Ok, there are several reasons why having your own branch for a task is simply much better than just commiting to trunk. First of all is to avoid breaking the build at all costs. Then to have the ability to do as many intermediate checkins as you need. 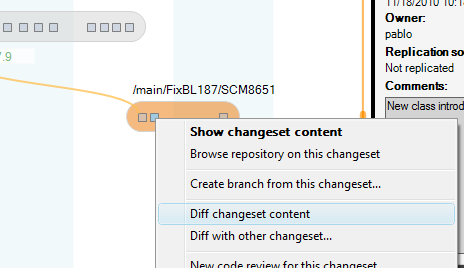 Having a separate branch also allows the same changeset to be merged into different development versions. As a product developer, we often have the current version, the next version in development and then some one-off versions from the current version incorporating specific, urgent changes for specific customers. Those changes both appear in the one-off versions for those customers and then have to be merged into the next-release version as well. And sometimes we have to back merge during testing of a release version as well because it is realized that we need the change in the upcoming release, not the next future release. Merging just to one trunk *might* work when you are doing work in-house without multiple customers. However, I have worked in those environments as well, and change sets with the ability to merge into multiple versions has always resulted in benefits from a testing and control perspective.